Grubsheet boards a Qantas flight to Perth this weekend with the same trepidation that now routinely accompanies our every trip on the iconic national carrier. 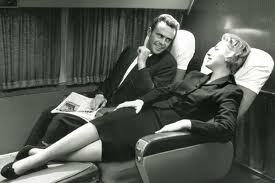 For once, our client is paying for us to fly in the “pointy end” but we still share some of the burdens of those less fortunate souls in “cattle class” – the same fetid air and disconcerting sense of being crammed into a aluminium tube, defying the rules of gravity at 35-thousand feet. Nowadays, there’s an extra element of stress from a gnawing feeling – doubtless widely shared – that flying Qantas isn’t as safe as it once was. Last November, it very nearly became the first airline in the world to lose the biggest airliner in the world. And few weeks pass without yet another report of engine failure, smoke in the cockpit or some other “incident” that raises a collective question mark over Qantas’s legendary safety record. Ageing but are they still safe? Today – as the nice lady on the PA system tells us – “we’re flying on a Boeing 767. Every aircraft is different, blah, blah, blah”. We know. Airfleets.Net tells us there are twenty-six 767s in the Qantas fleet with an average age of 17.7 years, older than the average age of its venerable global workhorse – the 747 – at 16.2 years. Of the 107 airlines worldwide which operate this aircraft, Qantas ranks 67th in fleet age, or close to the bottom third. Hmm. How old is this one, we wonder? The decor is decidedly 1980s, with a mottled slate grey bulkhead and overhead lockers fraying at the seams. Oh, it probably doesn’t matter if they look after the mechanics properly. The problem is that Qantas’s own maintenance staff are at war with the airline, using the media as a battlefield. They’ve made the startling claim that safety standards are being compromised by the company’s policy of shifting maintenance offshore. The Qantas management denies this emphatically. But who is the travelling public to believe? Now – as if the scrap with the engineers isn’t bad enough – the (mainly) blokes flying the planes are also at war with the airline over terms and conditions and also raising safety as an issue. Is this just the crimson hyperbole of your routine industrial relations stoush or a genuine harbinger of impending catastrophe? How on earth does the travelling public decide who is right? Is it Alan Joyce, the Qantas CEO, and his bean counters and spinmeisters, or the blokes in the peaked caps up front and the overalls on the ground with our lives in their hands? Such thoughts are apt to consume us as we peer out the cabin window at the clouds below, reflecting on a lifetime of Qantas travel and – we can’t help it – the appalling fragility of our own existence in the supposedly safe hands of the Flying Kangaroo. Grubsheet’s first Qantas flight was on a piston-engined Lockheed Constellation from Nadi to Sydney more than 50-years ago and we’ve travelled on every aircraft type since. Back then, the pilots would rev the Wright radial engines for what seemed an eternity to young eyes before the plane lumbered down the runway and climbed tentatively into the air for the seven-hour flight to Mascot. The Wright engines were notoriously complex and notoriously unreliable, so much so that Qantas would keep spare engines at various ports throughout the world. The jet age brought engines that, by contrast, were relatively simple and reliable. But with vivid memories of the constant “Connie” engine breakdowns and even fires of the 1950s (“Mummy, why has that propellor stopped?”), Grubsheet isn’t automatically fazed when it reads a media report of a modern aircraft diverting because of engine trouble. The problem is the frequency and severity of the long list of recent Qantas in-flight dramas, including the near loss over Indonesia last November of an Airbus A380 carrying 433 passengers like us. However much that might have been the fault of the engine-maker, Rolls Royce, the chronicle of other “incidents” suggests that something is clearly wrong at Qantas. But what? Are these random and even routine occurrences that may never have come to light without disgruntled staff and a hungry media to lap up their every grievance? Or does our national airline have a systemic problem with safety that makes it only a matter of time before it loses its first peace-time passenger in 90 years and makes a liar of Dustin Hoffman’s idiot-savant in Rain Man? Yes, “Qantas never crashes” but it almost did. And what’s it doing to fix things? Questions, questions, questions – all the time eroding the confidence of the travelling public. The airline has the mother of all battles ahead of it, not just in a PR sense – it seems – but to ensure its very survival. The decision by Moody’s to downgrade Qantas this week points to an airline gasping for revenue, not so much on its domestic routes where profits are evidently healthy but on its famed global network, where it’s struggling against the competition. It slashed services this week but some analysts are now privately canvassing the possibility of the once unthinkable – that the Flying Kangaroo is eventually slaughtered on the altar of shrinking yields and tighter margins. Qantas is so much a part of the Australian psyche that the whole nation would be traumatised even it survived by merging into a non-Australian global super brand. The loss of the Qantas name is unthinkable. Yet the days of Australians choosing to fly Qantas as a patriotic duty are long gone and the airline carries a hefty share of the blame. Treat us like cattle and we’ll behave like cattle, stampeding in the direction of those Asian and Gulf State carriers who treat us better on the ground and in the air. Our trip to Perth is a snapshot of the problem. We arrive at Sydney Airport to find that Qantas has practically replaced humans with computers altogether. We have to master a touchpad to check in and only a pre-issued electronic tag on our bag ensures a smooth transition to the baggage handlers. God knows how the elderly and computer illiterate manage. The struggle to get through security without having a nervous breakdown clearly isn’t Qantas’s fault. But it does have control over what happens for the rest of the journey and, sad to say, we don’t like it one bit. Not his finest role. 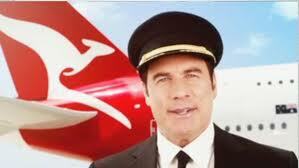 What’s John Travolta doing on Qantas? 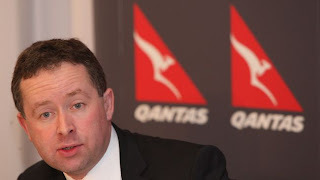 Grubsheet can cope with our national airline being run by an Irishman in Alan Joyce whose brogue is sometimes impenetrable. There’s an amusing story doing the rounds about the look on his executive team’s faces when Joyce talked about “buying a third Fokker”. But hey, it’s a global business and the odd “o” coming out sounding like a “u” isn’t an issue when you set out to recruit the best. What we really object to is being welcomed aboard our national airline – “the Spirit of Australia” – by an American dressed as a Qantas pilot when he’s not. John Travolta seems nice enough and isn’t a bad actor. But we simply don’t comprehend why the fact that he flies an old Qantas Boeing 707 for a hobby qualifies him to be the public face of the airline on the pop down screens before every flight. Where’s the real-life pilot hero, Captain Richard De Crespigny, who saved a planeload of people last year? Wouldn’t he be a more reassuring figure? We’re grumpy already. Our seats today match the age of the aircraft so we’re spared the new Marc Newson versions whose trays descend from the seat in front and collide with our ample girth. They’re clearly designed for lithe designers rather than real people. But perhaps that’s how you end up with too much of celebrity chef Neil Perry’s in-flight food. Who says Qantas passengers believe in the adage of less is more? Neil Perry, of course. So we’re subjected to a meal designed more for a rabbit than a real man. Hours later, we’re still trying to extract the bits of rocket from our teeth. We expected claustrophobia and the grating, sing-song inanity of peroxide blond cabin staff making their inflight announcements. But for God’s sake, can someone please bring us some real tucker and a stiff drink? Hooray. The drink part of the plea is met with a Bloody Mary that is truly first class, concocted by a woman of a certain age who clearly knows about such things. A brief moment of joy on a generally bleak horizon. We’ve reached the admittedly superficial conclusion that Qantas is an airline where style has triumphed over substance, where the tastes and values of its uber-trendy designers and famously gay cabin crew are more important than those of the ordinary Australians it’s supposed to serve. “I’ve been to cities all over the world” (and never endured such unsatisfying mush and unadulterated tosh. Pass the sick bag, indeed). So long as that patent loss of direction is confined to the cabin, maybe people less cantankerous than us can live with it. But what’s truly alarming is that the obvious organisational dysfunction of the company is intruding into an area that’s sacrosanct and non-negotiable to all Australians and has been for 90 years – to have the safest airline in the world. The internal warfare at Qantas has to end or the Flying Kangaroo is the most endangered species in aviation. Yes, Qantas can be bloody awful depending on which flight you take and on which day. But do you seriously think they are compromising safety to save money? It doesn't make sense. When the whole of your identity rests on 100 per cent safety, only a completely corrupt and bankrupt outfit would compromise this. What's the point? It's totally unproductive. I'm going to continue to put my trust in Qantas until there's real evidence that they're putting my life at risk for financial considerations. I don't think we're reached that stage. And until we do ( which I doubt) I'll continue to be a loyal frequent flyer. This is a very one-sided piece. Qantas has some old planes like the 767 but also has lots on new ones like the Airbus A380 and A330. Attacking it on the basis of one flight seems pretty unfair. I still think it's a lot better when it comes to safety than its competitors. Its pilots are second to none and simply wouldn't fly if there was a question mark over any aircraft. The airline business is pretty ugly these days. To single out Qantas is a bit rich. If you don't like the food, bring your own! So whatcha all wanna say now since Alan Joyce grounded the entire fleet? Still loyal customers? Still will to defend a brand that is intent on distroying itself so it can re-emerge as an Asian carrier? I was once a loyal and fierce advocate of the airline.. but those days are long gone..
Up until about 6 years ago, our family regularly flew Qantas & were happy with the experience. On our last flight to Alice Springs we began to think the standards were slipping, & it wasn’t because the steward accidentally tipped the coffee pot over my right side! Since then I’ve read the countless number of serious safety issues involving Qantas aircraft that are regularly posted on Australian News.com, which somehow don’t make it to the 6 o’clock news on tv. Incidently, Virgin, Jetstar, etc rarely rate a mention. We fly Virgin now for local flights and often pay more than if we flew Qantas, but I absolutely refuse to put my family’s lives at risk! My career is in the health industry, and I all too often see the graphic results of company’s & cost cutting. Patriotic I am, but only to a point, Qantas has gone down the dark road that can only end one way, and the sooner the better I say!